Being the visiting international guest at the District 5M-4 convention in central Minnesota was a special treat because not only was it close to home (1.5 hours) but there were so many old and new friends who made the convention fun. On January 29-31, Alexandria proved to be the site of a gathering of Lions just waiting to be somebody’s superhero. 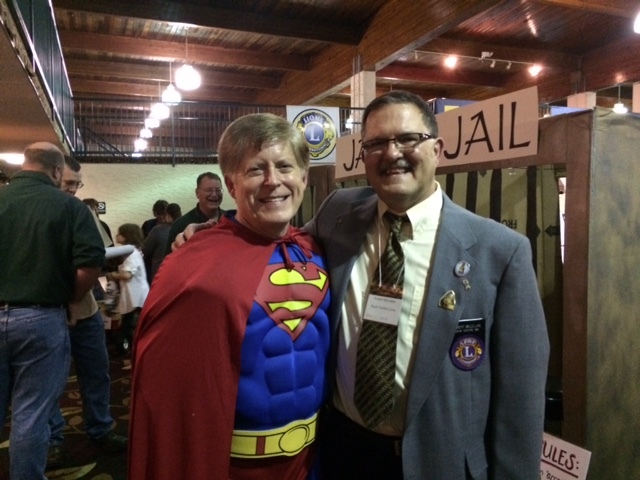 DG Todd (L) and ID Robert reveal their inner superheroes. The convention was filled with meetings so I had the opportunity to present the new LCI Membership 2.0 initiative to the Past District Governors, update the district cabinet about what was happening at the International Board level of LCI, discuss the Centennial programs and legacy projects with the club presidents, and promote the One Shot, One Life Measles Initiative to all of those in attendance. 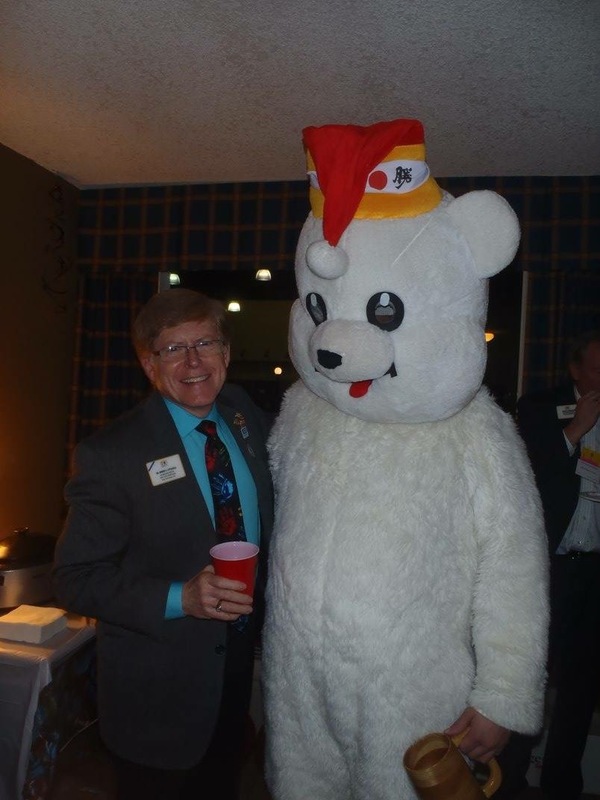 Only Joe knows who is in this polar bear costume. The polar plunge is a major fundraiser and this bear is not going to miss an opportunity to promote it! Individual clubs and the zone sponsored hospitality rooms on the theme, and each raised a considerable amount of money for the Governor’s charities. The Jail was quite popular as warrants were issued and bail was set. 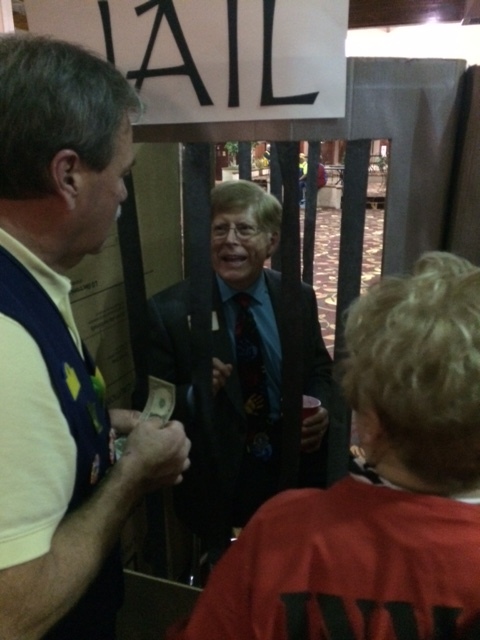 Fortunately, some kind benefactors paid my bail on Friday night when they put me behind bars. On Saturday night, my super-strength enabled me to avoid jail time. Saved by the generosity of Lions! The programs were quite inspirational. 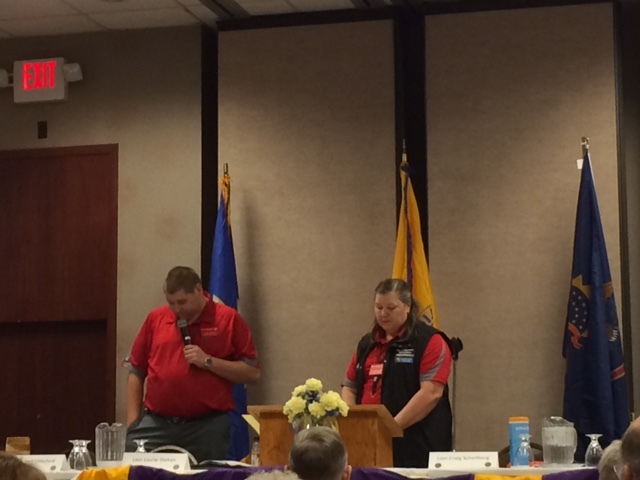 In particular, a mother and son duo—Laura and Joe Maki—presented a program on the benefits of the Special Olympics/Lions Club partnership in Minnesota. The young man explained how Special Olympics transformed his life and now his goal is to increase awareness among Lions in Minnesota. What a story of personal growth and what an impact he had on those listening. He told the audience about his plans to participate in the “polar plunge” and it wasn’t long for those in attendance to spontaneously raise nearly $500 to sponsor him in the event. Joe and Laura Maki present an informative and moving program. 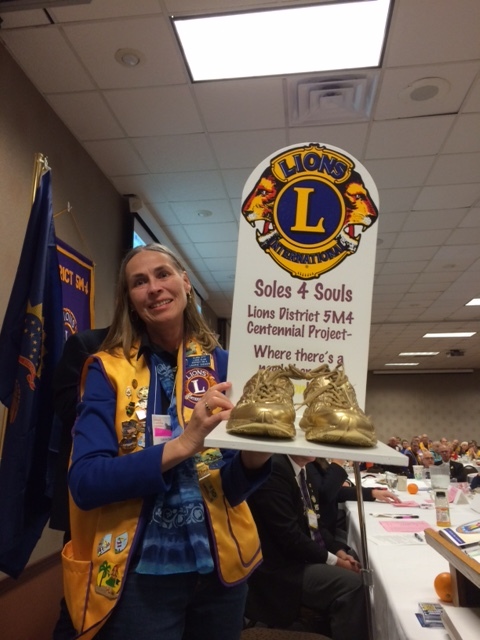 Another program led by Lion Laurie Dieken was very informative about the Soles4Souls program providing shoes for people in need. Since 2006, Soles4Souls has distributed 26 million pairs of shoes in 127 countries around the world. Over half are distributed in the United States, as over 600 individuals are homeless in the U.S. and a new pair of shoes may be their first step towards a better life. In District 5M-4, clubs took on the program as a Centennial Project and to date, have gathered thousands of pairs of shoes. After sorting, the new and usable shoes are distributed and the worn out shoes are recycled. Over 8,000 pairs were collected from clubs at the convention! I know where some extra shoes in our house might be put to good use. A traveling trophy was made to build the competition as clubs vie to see who can collect the most shoes. I was so pleased to induct four new members in District 5M-4: Jacquelyn Heinen and Johanna Wiener from Sauk Centre, Jan Beyerl from Clara City, and Nicole Rapp from Wendell. We raised $785 for the One Shot, One Life Measles Initiative! The generosity of the Lions was overwhelming, so Kathy and I provided a partial match to add to the total donated from District 5M-4. 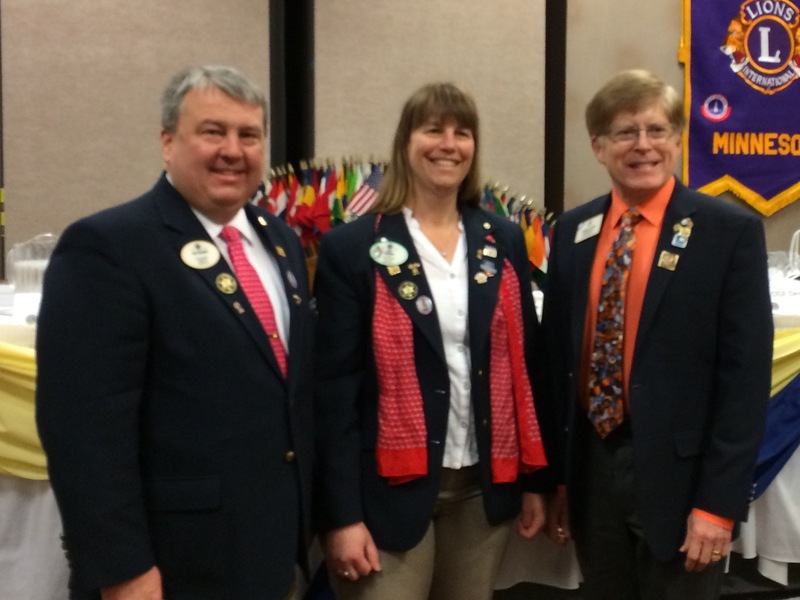 District Governor Todd Neumann and his wife, Lion Ruth were great hosts and DG Todd demonstrated his willingness to lead by example. 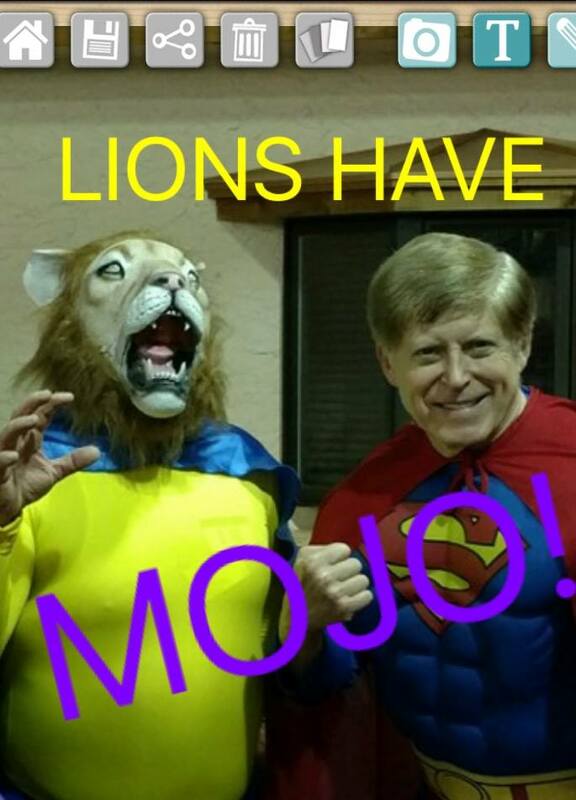 He wore an Underdog costume on Friday night and took on the role of Super Lion on Saturday night. He knows how to have fun and his “mojo” was infectious. (L) DG Todd Neumann, Lion Ruth, and ID Robert. Past International Directors from Minnesota—Brian Sheehan and Mike Molenda—were in attendance, as were their spouses—Lion Lori and Lion Linda. 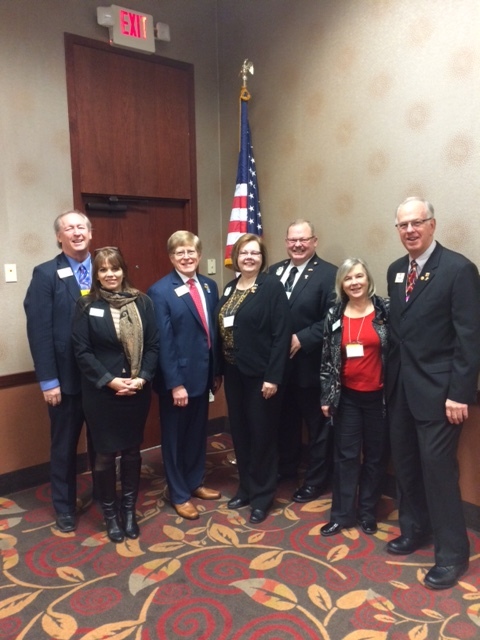 We served together on the Board of Directors last year and we had a great time catching up. PID Maynard Rucks also attended to promote the upcoming Multiple District Convention. It was especially fun to have a member of the Fargo Lions Club—President Elect Paula Swanson—in attendance with her children. Her parents—Council Chair Kathy Jensen and Past District Governor Dave Jensen—play important leadership roles in the district and their club in Wendell is award-winning! CC Kathy receives recognition for her service. 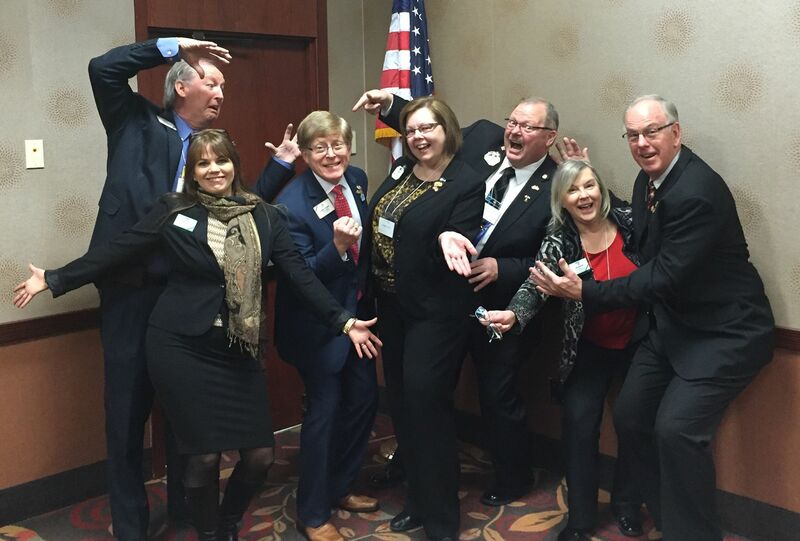 A surprise for me was the attendance at the convention of a former college fraternity brother and his wife—Lion Bob and Pam McLellan—from Sauk Centre. We hadn’t seen each other for many years, while maintaining contact through annual Christmas letters and cards. 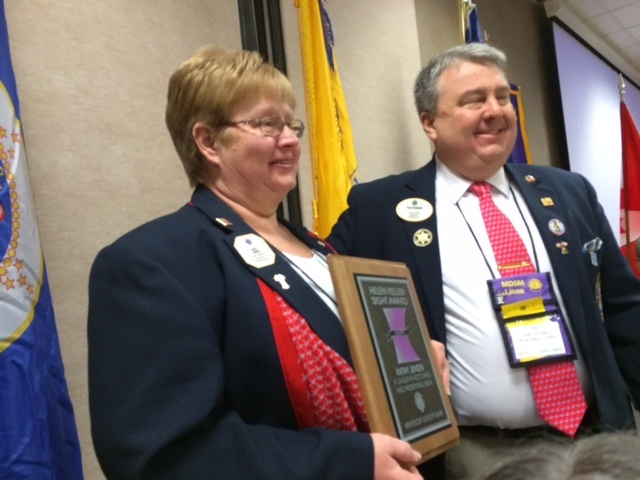 At the end of the convention, DG Todd made me an honorary recipient of the “Heart of a Lion” Award. As I drove North to Moorhead, I was filled with warm thoughts about the convention and all of the new and old friends who made my visit such a positive experience. Now, off to Tennessee!